It’s taken me two years to find Arty the Marsh Fritillary caterpillar Euphydryas aurinia. I found him when I was out in the Salisbury Plain Training Area searching for larval webs with Mervyn Grist and the Bulford Conservation Group (BCG). Mervyn has been conducting these larval surveys and collecting this important data with the help of the BCG since 2001. During last year’s survey I didn’t find any. 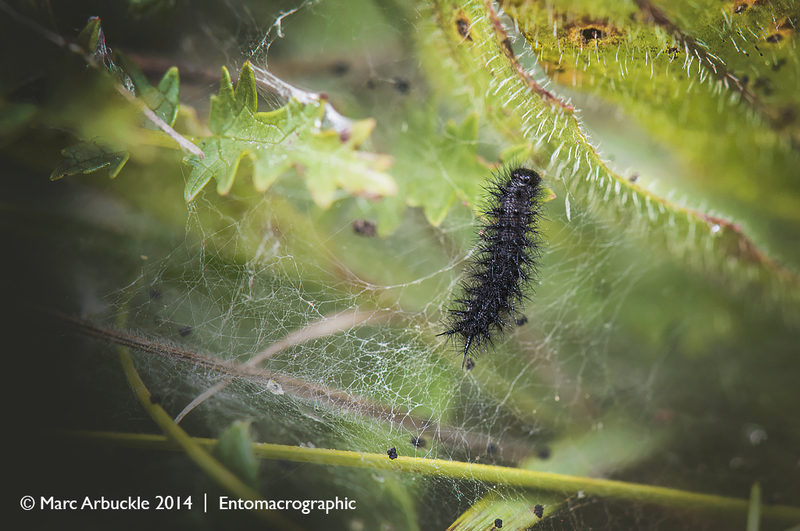 But this year I found three webs, two had been vacated but the second had three tiny black caterpillars inside. One of which is shown above. The once widespread Marsh Fritillary has declined dramatically throughout Europe and is regarded as endangered or vulnerable in most of its range. The UK is actually one of its remaining strongholds, but even here it has declined by over 60% and has become extinct in much of Britain. However, Salisbury Plain is recognised as an important (and protected) breeding site for the species and fortunately at approx 300 square miles, it’s big, but better than that, it’s right on my doorstep. Ironically protection for the butterfly has come because the British Army use about 150 square miles of the Plain as a military training area, particularly its heavy artillery and tank units. Subsequently this little butterfly has been nicknamed the ‘artillery fritillary’ or as I call it ‘Arty’. Due to about 340 days of live firing, about 39 square miles are permanently closed to the public, and access is greatly restricted in other areas, although conservation groups like ours can get access on non-firing days, subsequently it’s a wildlife haven and if you like butterflies. A privileged glimpse of what we’ve lost. The female fritillary will look for Devils-bit scabious Succisa pratensis, crawling down through the vegetation to lay from 150-350 eggs in neat rows on the underside of one of the basal leaves. She seems to have a preference for prominent, medium-sized plants growing in a sunny position. After hatching the caterpillars spin a dense web for protection and after eating the first plant crawl off together to find and spin a web in another. They might do this several times. Fortunately this makes surveying relatively simple. Spotting the dark purple flowers of ‘devil’s-bit’ is easy enough as is the rather conspicuous larval web. However, there is a lot of scabious on the Plain, which is a good thing, but bending over to check the base of each one, hour after hour, is back-breaking work. Can I just remind you I found 3 webs and 3 caterpillars. As the caterpillars grow they moult their skin – each of these changes is called an instar. At the third instar they change from greenish-brown to black with a speckling of tiny white spots and rows of short black spines. At the end of August, early September the groups break up and individuals go their separate ways. The caterpillars will reappear in February or early March after making a new web on a scabious plant where they may be seen clustered together absorbing the warmth of the sun. By early May they will have pupated into a chrysalis and the adults will start to emerge two or three weeks later. Incidentally the little black dots around the caterpillar are frass (caterpillar poo). Super read and excellent photo mate. Hello Jim, Good to hear from you chap. Glad you enjoyed reading about my search for the little blighter. I did see your post. It wouldn’t be this caterpillar because this little fella is VERY fussy about what it eats. Either Devil’s-bit Scabious or Field Scabious that’s about it, plus I’m not sure if you get Marsh Fritillary butterflies in the Southern hemisphere? Let me know if you do. I encountered a similar caterpillar a few weeks ago In New England. I doubt it’s the same one described in your article, but they look very similar. What was strange about the one I encountered is its agility: It was the fastest caterpillar I have ever seen. I’m not sure if you have the Marsh Fritillary in New England as I think it is confined to the Palaearctic region. But you may have Fritillaries so it could well have been a similar looking larva that you’ve seen. As for their speed and agility, that may well explain why it has been so difficult to find. It’s obviously seen me coming and legged it.